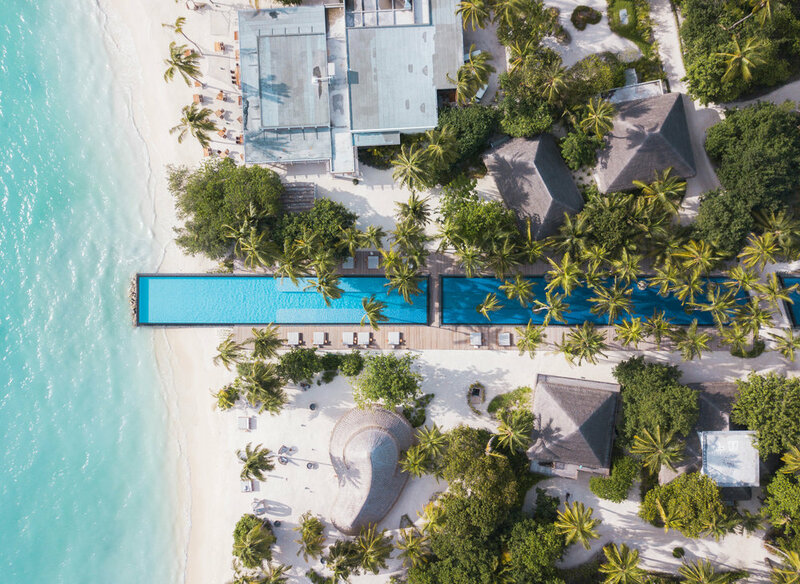 Fairmont Maldives, Sirru Fen Fushi is a newly opened all-villa resort located on the Gaakoshibee Island of Shaviyani Atoll in the northern part of Maldives. Sirru Fen Fushi translates to "secret water island", and this is exactly what you can expect while staying in one of the 120 luxurious villas. The isolation, limited human activity, and the laid-back vibe mean there is little to do in these villas, and that’s exactly why you should be here! Not everything in this resort owes its magnificence to the island’s natural beauty. The villas, themselves, deserve applause for their classical décor and all the top-notch amenities you can think of. Nothing bespeaks the resort’s creative design more than the Coralarium, an art installment that serves to bring nature and art together. This exhibition is the world's first semi-submerged tidal art gallery designed by the renowned environmental artist, Jason deCaires Taylor. The villas are thoughtfully designed to integrate them elegantly with the surrounding landscape. Thatched roofs are perched on whitewashed walls and the personal deck areas are equipped with loungers next to the private pools. Each unit has a private sandbank and so you won’t have to compromise on privacy. The bathroom with copper fittings and the wooden furniture with carved details give the villas a rustic and bohemian look. A ladder descends from the over-water villas separating your comfy bedroom to the warm waters by only a few feet! Relax, revive and rejuvenate in the Willow Stream Spa - a tranquil oasis that brings you closer to the elements of nature. Each treatment, from traditional Ayurveda to Kerstin Florian, uses local herbs and aims to connect you with the local culture. The spa also has a 25-meter long serenity pool that is a pleasure for the senses, for its soothing aroma and calming lights and music. Fairmont Maldives regularly organize Muay Thai, Pilates, yoga, and Warrior Workout lessons, as well as football and tennis matches. In addition, the dedicated personal trainers in their state-of-the-art gym ensure that you’re in shape even on your vacation. Raha Market is the most diverse restaurant on the island with options ranging from local Maldivian, Asian and Continental to healthy gourmet dishes and organic juices. Kata, the Japanese restaurant, sushi bar and lounge is run by Chef Dharmen, who offers creative and modern dishes with a Maldivian touch to the Japanese dishes. Azure brings fresh seafood caught daily in the area, along with an excellent assortment of wine and champagne to your table. Onu Onu, built entirely with bamboo, has sun loungers and open fireplaces. It offers a relaxed atmosphere next to the pool.